River Valley Road under Groat Road Bridge, including the shared-use path, reopened to all users at 6am on January 30. Various nighttime closures (8pm-6am) of Groat Road Bridge to motorists are scheduled through the month of February 2019. Adhere to signage in the area. Updates will be posted on social media and with 311. Demolition of the northernmost portion of the existing bridge superstructure will take place over River Valley Road. This demolition work is completed utilizing a large land-based crane to disassemble the end span of the bridge; due to the footprint of the crane and the risk associated with hoisting heavy loads in excess of 100 tonnes, River Valley Road will be closed for the extent of these particular demolition operations. Following the demolition of the existing bridge superstructure, new steel bridge girders will be installed as the first step in the reconstruction of the bridge. Installing the bridge girders on the northernmost portion of the bridge will require closures of River Valley Road in order to ensure the safety of the traveling public as loads of up to 80 tonnes are hoisted over the road and secured into place. 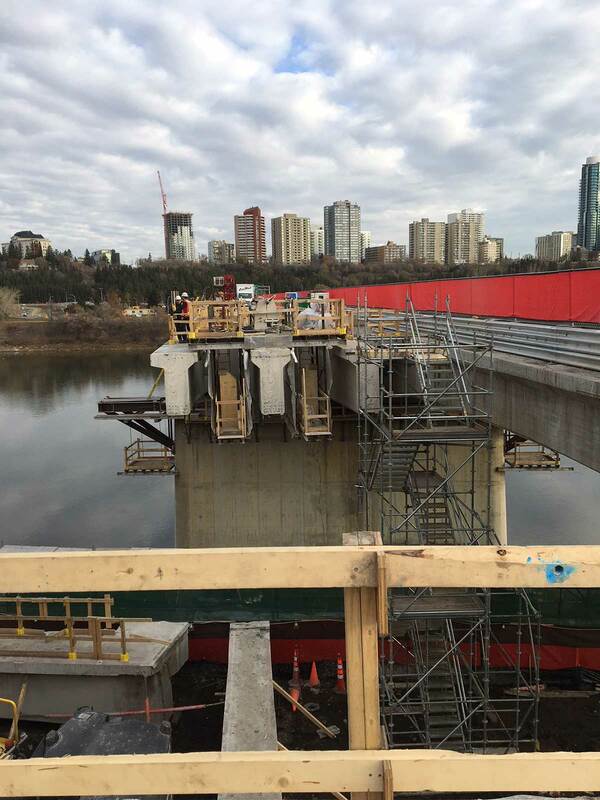 During reconstruction of the north bridge abutment located on the north edge of River Valley Road, it may be necessary to implement short-duration road closures for logistically-restricted construction operations, such as major concrete pours. These restrictions will generally be short duration and limited in nature. During the course of superstructure demolition on the west side of the existing bridge, there will be a series of full closures of Groat Road Bridge. These closures are required for certain critical demolition operations to ensure safety for both workers and the traveling public, and will be coordinated to occur during nighttime hours to minimize impacts to commuters. Major concrete pours that are required for reconstruction of the new bridge deck will require full closures of Groat Road Bridge due to spatial constraints and to ensure long-term construction quality. These concrete pours will occur during nighttime hours to minimize impacts to commuters. The gantry cranes being utilized for demolition and reconstruction operations are supported on two sets of rails – one that runs down the center of the existing bridge, and one that is located on a truss that spans across the river on the outside edge of the bridge. Following completion of the demolition and reconstruction of the west side of the bridge, this truss will need to be removed from the west side of the bridge and installed on the east side of the bridge in order to commence the final phase of demolition and reconstruction works. This will involve lifting the truss overtop of the existing travel lanes on the Groat Road Bridge. 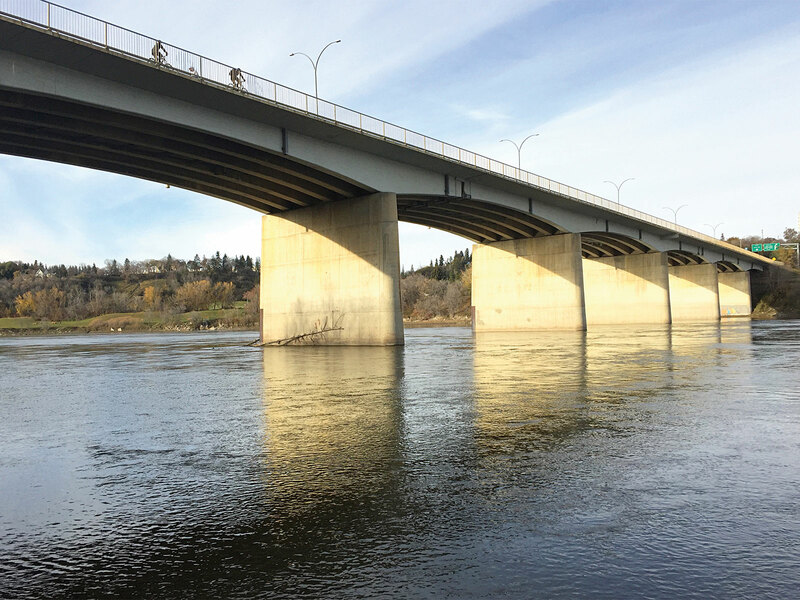 Performing this task will necessitate a series of full closures of the Groat Road Bridge; these will be coordinated to occur during nighttime hours in order to minimize impacts to the public. Details of the project scope and impacted areas. 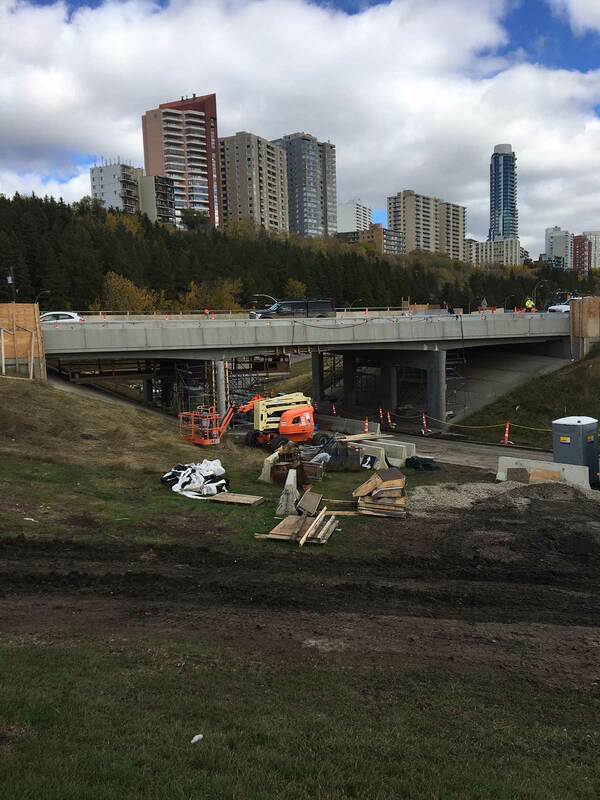 The City of Edmonton is undertaking the rehabilitation of three Groat Road Bridges and Groat Road from 87 Avenue to the North Saskatchewan River beginning in 2018. The Groat Road Bridge over the North Saskatchewan River was constructed in 1955. The last major rehabilitation of this bridge occurred in 1989-1990. Rehabilitation will extend its service life by at least 50 years and improve the functionality of the existing sidewalk by widening it to shared-use path standards. The Groat Road Bridge over Victoria Park Road was constructed in 1954. The bridge is generally in good condition but currently requires a wearing surface replacement, new deck joints and other miscellaneous repairs. The Emily Murphy Park Road over Groat Road Bridge was constructed in 1963. The bridge is generally in good condition but requires some minor rehabilitation to extend its service life until more substantial rehabilitation work is needed in 10 years or more. Additionally, the north sidewalk will be widened to shared-use path standards. 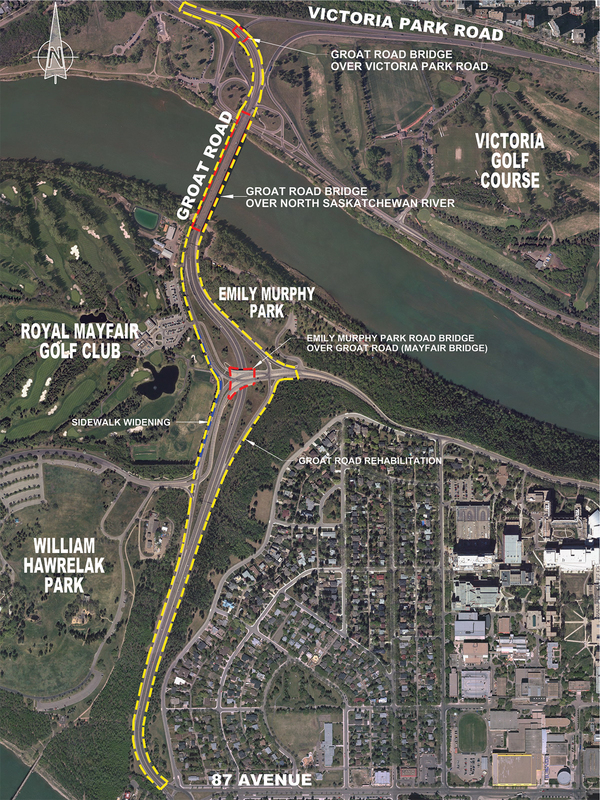 Groat Road from 87 Avenue to the Groat Road Bridge over the North Saskatchewan River, including the ramps at Emily Murphy Park Road/Bridge and Hawrelak Park, will be renewed as part of this project. Work is anticipated to be completed by 2020. The sidewalks on the east side of the ramp from Emily Murphy Park Road and from the Mayfair Bridge to Hawrelak Park will be widened to shared-use path standards. Field Investigation - As part of the permitting process for this project, the Project Team completed a field investigation in spring 2017 to determine if historical or archaeological artifacts are present in the key portions of the project area.